The Palace of Versailles, which represents an exceptional example of French art from the 17th and 18th centuries, was the principal residence of Louis XIV, the French Sun King. S.T. Dupont, drawing inspiration from the splendours of the court of Louis XIV, has created this outstanding Limited Edition made in white lacquer and gold and decorated with a golden sun, the emblem of Louis XIV. S.T. 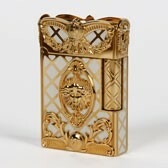 Dupont Versailles Limited Edition consists of two pens numbered out of 1686 – the date in which the Sun King moved to Versailles - two pocket lighters numbered out of 2686, a table lighter, a cigar cutter, an ashtray, a pair of cufflinks and a money clip numbered out of 686.